Your pregnancy is a time of excitement and joy, with changes every day as your baby develops and grows, getting ready to arrive in the world. Nine months are just a short time compared to the life you are creating and your Maternity Photoshoot will focus on capturing the beauty that radiates from you at this time of anticipation and love. Capturing your pregnancy is an amazing experience you don’t want to miss as you bloom in feminine energy. It is my recommendation that you book your maternity photo session for when you are between 6 and 7 ½ months pregnant. At this time your growing bump is showing but you are not yet too uncomfortable. An early pregnancy photoshoot also leaves you plenty of time to enjoy the photographs before the arrival of your beautiful newborn baby. I’d always dreamt of having a family photo shoot done when I was growing up, and now, with my pregnant wife and 2 daughters, this dream was made real by Gemma and her Enchanted Photography studio. The relaxed nature, hospitality, and professionalism made this experience first class, and the quality of the photos was amazing. Your pregnancy photoshoot will take place in the larger of the two photography studios here at Enchanted Photography. The studio room is the most versatile, designed in a L shape with a curved white wall for contemporary and modern style pregnancy images as well as an array of designed walls including a faux white brick wall as well seamless colours to suit your bump photoshoot ideas and home decor. A wide range of posing stools, chairs and photography props allow me to tailor your images to suit your preferred style. Within the 1,500 sq ft photography studio premises there is also a separate changing room with full length mirror plus a kitchen area for teas, coffees and snacks. There is parking directly outside the studio for your convenience. The short time in which you and your unborn baby are one is an incredibly precious experience that too quickly becomes a fond memory. Pregnancy is such a private and personal experience that as your photographer I want to capture just the way you see it. Before your photoshoot I’d love to chat with you about your photo ideas, images you have seen and like, your inspirations and what you want to see when you return to view the photos from your maternity photoshoot so I can make sure you have a gallery full of images that will bring a smile to your face every time reminisce and see them. Enjoy the precious journey of your pregnancy in a relaxed and fun bump photoshoot at the Enchanted Photography studio. Maternity photography is such a personal experience. Choose a personal and classic portrait, something more sultry to capture this intimate time, or opt for something more fun or funky to show off your bump. It is up to you! As your maternity photographer I can focus solely on you and your developing bond with your unborn baby or we can create some lasting memories by including your partner and older children in your photoshoot. Your comfort is important to me. Refreshments will be on hand throughout your photoshoot while a large changing room is just two steps away from the studio room for you to get changed, and to retouch your make up and hair. Coming back one week later, you can relax on one of the huge leather sofas in the studio viewing room. See the best images from your maternity photography session first as a slideshow and take in the mesmerising beauty of motherhood. We can take our time going through each individual image to select your favourites to print and to keep as a digital copy. The homely studio room is designed so you can imagine each photo in your own home, as a canvas or striking acrylic art piece in your bedroom, lounge or family room. Each photo can be digitally edited until it is picture perfect, with any blemishes and marks lightly removed. These are memories that will last forever so they need to be just right! Your memories of impending motherhood are now preserved forever. To book a pregnancy photoshoot there is a booking fee relevant to your preferred session type as detailed in the grids below. I booked Gemma to have some photos taken. I have just seen the photos and I’m blown away by them. Beautiful photos and by the sounds of it Gemma went out of her way to get great images. So pleased I took a gamble on Gemma. 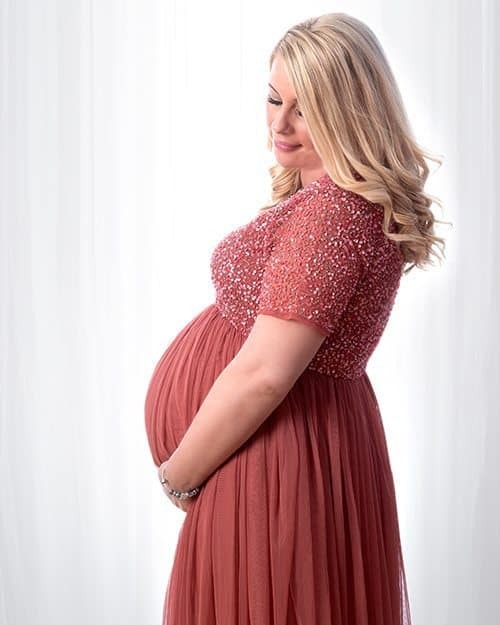 With over 8 years experience photographing mothers-to-be, I will tailor the photoshoot around you and your bump and offer professional advice based on my experience to get the very best from you during your time in the photo studio. Being comfortable in front of the camera is a priority which is why everything has been thought about for you including easy access parking, comfortable seating, a changing room with plenty of space, air conditioning, hot/cold drinks and crucially a bathroom ‘just for you’. Your confidence as a woman is key to capturing stunning images, and while pregnancy is a beautiful time you can feel safe in the knowledge that our tailored service can edit and smooth any stretch marks or blemishes that can occur at this special time. All sessions include high quality digital copies of your favourite images for long-lasting memories you can enjoy over and over again. Choose from a wide range of high quality albums, wall art and photo cubes for your home for daily reminders of how beautifully femine you were.